Clarkson Potter/Publishers, 2016. 176 pages. Any book lover will enjoy this book. It’s quirky – even has the cover opening in a different direction from the way the pages turn. 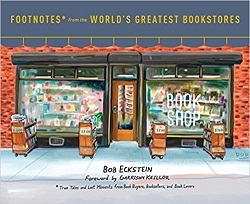 The author is also an artist and has a painting of each featured bookstore – and they truly are from all over the world. If I had lots of money and time, it would be so much fun to buy a copy of this book and travel the world and try to visit all the bookstores. Each bookstore has a brief description, usually including something notable about it. Then on top of the painting of the bookstore, there is a quotation from someone who works there, telling a story about something that happened at that store. As an example, here’s what they’ve got for Books of Wonder (minus the painting), a store I ordered Wizard of Oz books from for my kids. I’ve never visited it, but I’ve got a warm spot in my heart for it. Books of Wonder’s claim to fame is that it was the model for the bookstore in the 1997 film You’ve Got Mail. Nora and Delia Ephron, who wrote the film, were both longtime customers and friends of the store – and Meg Ryan spent a day working at the shop to prepare for her role in the film. In 1985, Books of Wonder established a joint imprint with William Morrow and Company, publishing its own children’s books. Its standing-room-only events have included celebrated authors like J. K. Rowling, Madeleine L’Engle, Maurice Sendak, and Eric Carle. There’s lots more where that came from! This book will make you smile and also make you want to go shopping for books. 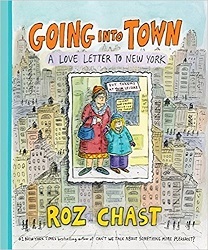 This book is an introduction to New York, which New Yorker cartoonist Roz Chast created for her children, who did not grow up in New York City, like she did. Here are some selected things she says about the book. You’ll have to imagine the entertaining cartoons that go with these words. This is not a “definitive guide book” to Manhattan. In fact, it’s not really a guide book. There’s nothing in here about the Statue of Liberty, for example. Why? Because I’ve never been. I’d like to go. Someday. Just not today. Please don’t make me go today. This is also definitely not one of those “insider’s guides” where I tell you about the hippest clubs, the swankiest restaurants, the edgiest neighborhoods, the coolest gyms, or the store where the best people buy the most exclusive shoes. It’s not a history book. Do not imagine, even for a second, that I’m going to tell you a bunch of cool facts, like how Betsy Ross invented concrete, or that a thousand feet under Grand Central, somebody discovered an old Pilgrim restaurant, and look, here’s the menu: . . . I feel about Manhattan the way I feel about a book, a TV series, a movie, a play, an artist, a song, a food, a whatever that I love. I want to tell you about it so that maybe you will love it too. I’m not worried about it being “ruined” by too many people “discovering” it. Manhattan’s been ruined since 1626, when Peter Minuit bought it from Native Americans for $24.00. Now my kids are grown-ups. The city has changed since I was 23. Things have happened. Some good, some bad, some very bad. But I still love it more than anyplace else, and hope you will too. She does communicate this affection in the pages that follow. And despite saying it’s not a guide book, the next time I go to New York City, I’m going to check out this book and carefully review her chapter on the basic layout of Manhattan – it makes it all very clear and logical and would be tremendously helpful. And along the way, I’d get many ideas of things to do and places to visit. And on top of all that, the book has plenty of things that make you laugh. It’s fun to read even if you never have gone to New York City, but will certainly make you want to remedy that situation. The cover opens upward (with the spine on top, horizontal), and you see the lion’s paws unfolding a map of Paris, which will trace his route. 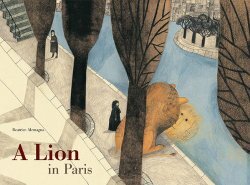 The lion begins his journey around Paris at the train station, the Gare de Lyon, and from there we get a wonderful tour of Paris, from a lion’s eye view. The lion’s heart was beating very fast as he continued his long walk. At the top of an endless flight of steps he saw a white castle. “It looks like a cream cake, doesn’t it?” said an old lady, smiling at him. “Grrr,” replied the lion. They went back down all the steps together. In 2008, Amy Thomas had a wonderful week’s vacation in Paris. Little did she know that would lead to bigger things. That trip was the first time I was in Paris during the summer, and it was absolutely amazing. I loved that it was light out until after 10:00 p.m., giving me several extra hours to roam back-alley streets and sit by the Seine. I was excited to discover new neighborhoods like Bercy and Canal Saint-Martin and new “bistronomy” restaurants like Le Verre Volé and Le Comptoir du Relais. I got sucked into the semi-annual sales, les soldes, and hooked on Vélib’s, the public bike-sharing system. By that time, I was just as obsessed with sweets as I was Paris. I had a column in Metro newspaper called “Sweet Freak” and a blog by the same name. I knew every bakery, dessert bar, gelateria, tea salon, and chocolatier in New York City. When I traveled, I built my itinerary around a town’s must-visit sweet spots. So naturally during that week in Paris, I researched the city’s best chocolatiers, mapped out a circuit, and then Vélib’ed between eight of them. It was exhilarating and exhausting, not to mention decadent. It was a chocoholic’s dream ride. I wrote about my Tour du Chocolat for the New York Times, and it went on to become a top-ten travel story for the year. As I was secretly plotting a way to spend more time eating chocolate in Paris, the in-house recruiter of the ad agency where I worked casually walked into my office one day and asked if I wanted to move to Paris. I was getting transferred to write copy for the iconic fashion label Louis Vuitton. It all happened so suddenly, and seemed so magical, that I had to ask: was Paris my destiny or sheer force of will? I guess it goes to show that you just never know where life will take you. You search for answers. You wonder what it all means. You stumble, and you soar. And, if you’re lucky, you make it to Paris for a while. Here’s what happened when I did. 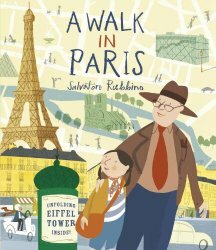 Readers of this book now have a fabulous excuse to go back to Paris. I’ve got to try some of these! One thing’s for sure. The next time I go to Paris or New York City, I’m going to bring this book — or at least the addresses from it. Source: This review is based on my own copy, which I got at an ALA conference and had signed by the author. Chronicle Books, San Francisco, 2013. 36 pages. 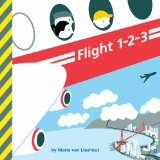 As a counting book, and as the ideal book to familiarize a small child with plane flight, this book is wonderful. The book begins, “When taking a flight, what do you see?” We’ve got 1 Airport, 2 Luggage carts, 3 Check-in desks. Most of the people are the iconic figures you see on airport signage, except the family we’re following. The boy has a yellow cap and backpack, and his parents distinctively come along on the journey through the airport and security to the gates and the airplane. This is just a lovely book to look at. The simple font and iconic pictures are perfect for small children to easily see what’s going on. And they will be able to find the things from the book in the airport, whatever airport they may happen to visit. I so wish this book had existed when my children were small and we were flying around Europe! As it is, I think this will spark a “Things That Go” theme for my next Mother Goose storytime. I want to let all the parents know about this wonderful book! Jeremy P. Tarcher (Penguin), 2013. 151 pages. This is a lovely little book, in paperback and designed to easily fit in a travel bag for airplane reading. I’ve never really been afraid to fly, but Julia Cameron writes in a way that makes her feelings universal, even if you’re not dealing with that particular fear. She approaches her fear of flying with story. She tells about a memorable flight, telling us her frightened prayers she sent to God, and then the reaction of the two frightened flyers sitting in her row. She talked with one seatmate about praying to overcome her fear — and then he ended up flying back on the same flight as she did! Once at her destination, she got strategies from friends, like postponing worrying and acting as if. Those strategies, combined with prayer and helping someone else, healed her fear of flying, as demonstrated when she took a third flight to meet her firstborn grandbaby. Dear God, I am frightened. Please let us find smooth air again. Get us out of this turbulence. She also intersperses quotations from others about flying and tips for the reader to try. Even though I’m not plagued by a fear of flying, this book was a lovely reminder to trust God about things I was worried about. Brilliance Audio, 2011. 9 discs, 10 hours, 43 minutes. This audiobook was a fun one to listen to while driving to work and back. It felt a little on the long side, but I handled that by giving myself breaks of a few days in between discs. The narrator sounded a little too much like a teenager to me, actually sounding a whole lot like Natalie Moore, who narrated Dairy Queen. However, I got used to her voice and rationalized that the author was indeed a lot younger than me, so it was okay. The book is about Wendy McClure’s childhood passion for the world of Laura Ingalls Wilder, and her quest to revisit the world of the books by seeing all the Little House sites peppered over America. Now, I’ll confess right up front that I never read the Little House books myself. I think I read the first one, Little House in the Big Woods, on the urging of Karen Iwata, my best friend in second and third grades, but I thought it was frightfully boring. Those pioneer books didn’t grab me. I remember I also gave up on Caddie Woodlawn. However, when my sons were growing up, my husband read them all the Little House books, which he had read and loved when he was a child, and I listened in and found them not so bad at all. What’s more, we had visited the home in Missouri where Laura lived as an adult and wrote the books. And I certainly know about loving childhood books! Some day, some day, I will visit Prince Edward Island, where Lucy Maud Montgomery set her books. Hmm. Maybe I should write a book about it when I do. Though at least Laura Ingalls Wilder had many, many home sites, so Wendy McClure did have a book-length story to tell. I found the book all the more fascinating because right now I’m in the middle of researching my family history. I keep thinking of the old picture I saw of my grandma as a baby with her brothers in front of their sod house. I remember her telling me, “Just like Laura Ingalls Wilder!” She and my grandpa were actually born in Indian Territory in what is now Oklahoma — so quite near the original Little House on the Prairie. What’s more, lots and lots of my ancestors were pioneers and farmers, moving steadily west, so the world of the Little House books is really quite close to the story of my own roots — and that made Wendy McClure’s visiting the home sites all the more interesting to me. And I have to admit, Wendy McClure knows how to make the tale interesting. She tells about each place she visits, the people she sees, and what she felt to see them. She explores lots of her feelings about the books and about the places, many of which any book lover can easily relate to. She also throws in facts about Laura and her family, but sprinkles them nicely so we don’t get bored. In short, I recommend this book for anyone who loved the Laura Ingalls Wilder books, or just anyone who loves going back to the children’s books they cherished as a child. The story doesn’t have a lot of tension or a driving plot, but that actually makes it nice listening for a commute. And, hey, anyone who gets a chance to do a Little House road trip, following the steps of Laura Ingalls Wilder (and Wendy McClure), will definitely want to have this for the ride. Walker & Co., New York, 2010. 205 pages. I’ve always loved books about the cross-cultural experience of living in another country. Deborah Fallows has a PhD in Linguistics, and makes her story even more interesting by reflecting on aspects of the Mandarin language and the ways they are reflected in the Chinese people and culture. She and her husband lived in China for three years, and this book is a fascinating look at her experiences. Don’t tell, but I’m already plannning to give a copy to my nephew for his birthday — He just spent two semesters studying in China. I wonder if he will have noticed some of these same things. “The language paid me back in ways I hadn’t fully anticipated. It was my lifeline to our everyday survival in China. My language foibles, many of which I have recounted in this book, taught me as much as my rare and random successes. The language also unexpectedly became my way of making some sense of China, my telescope into the country. Foreigners I met and knew in China used their different passions to help them interpret China: artists used China’s art world, as others used Chinese cooking, or traditional medicine, or business, or music, or any number of things they knew about. I used the language, or more precisely, the study of the language. “As I tried to learn to speak Mandarin, I also learned about how the language works — its words, its sounds, its grammar and its history. I often found a connection between some point of the language — a particular word or the use of a phrase, for example — and how that point could elucidate something very “Chinese” I would encounter in my everyday life in China. The language helped me understand what I saw on the streets or on our travels around the country — how people made their livings, their habits, their behavior toward each other, how they dealt with adversity, and how they celebrated. Her result is completely fascinating. You will enjoy this book if you are at all curious about people and language.